This is what happens when kids try to fix their own problems. I was sitting in my Lazy Boy getting caught up on some World Magazine issues that I had missed reading. Lexi, our 10 year old was having a bad night. She had just gotten some hot chocolate, when somehow, she knocked it over in our living room and it went all over the carpet, the sofa, the miniblinds, the wall, etc. What a mess! It was an accident, so I couldn’t get too upset–after all, I’ve had worse accidents! And like most things in life, I simply found it interesting. But Lexi was clearly upset. After a time of her cooling down, I called her over to come sit in my lap. I asked her how she felt about the whole hot chocolate incident. “I feel like an idiot,” she whimpered sadly. So I brought the machine upstairs and showed her how to fill the shampoo tank in the sink and empty the dirty one into the toilet, how to spray, scrub, and vacuum the sofa and carpet. And then for the next hour and a half while I resumed my World Magazine reading, Lexi went to work on them–all by herself. She did the carpet and the sofa, and then kept going–under all the cushions, the other sofa–things we’ve never cleaned before. And she was loving it! I tell you all this because one of our key parenting principles that kids must eventually learn to solve their own problems. Too often we parents make their problems ours. Either we rescue them (helicopter parents) or we belittle them (drill seargents). By giving them responsibility to fix their own problems we honor them and treat them as contributors, rather than simply dependents. At such times we should act as consultants. And they may learn some new life skills as well. In fact, just before bedtime, I caught her on the computer printing something out. This is what it said. 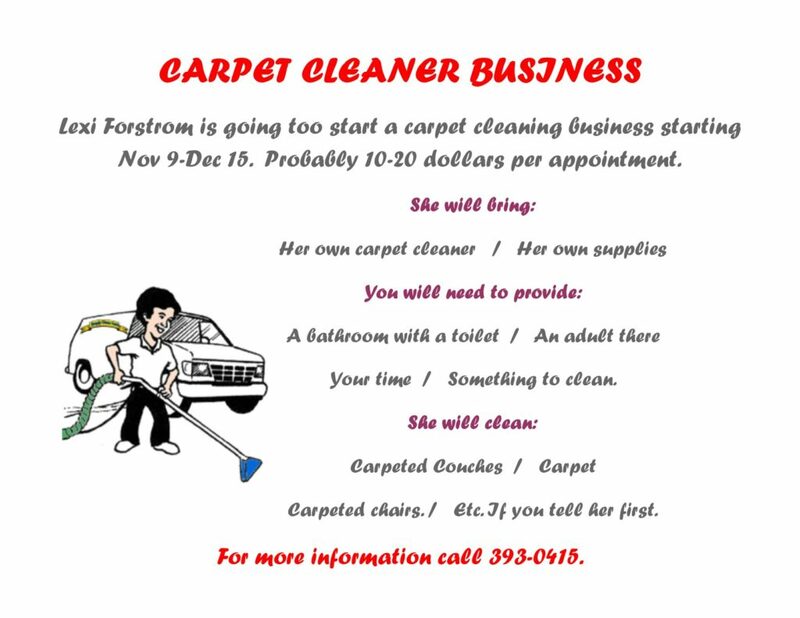 Lexi Forstrom is going too start a carpet cleaning business starting Nov 9-Dec 15. Probably 10-20 dollars per appointment. Your time / Something to clean. Carpeted chairs. / Etc. If you tell her first. For more information call 393-0415. In many homes, a cup of spilled hot chocolate would result in frustration, anger, yelling, tempers, and words. In our “fix your own mess” home that spilled cup might result in a promising career! I would highly recommend Lexi to do your carpets! She did our family room for us and what an excellent job she did – and our carpet looks awesome! She was dilligent and thorough in her work – and her “supervisor” (DAD) kept her on task :>) Thanks, Lexi!